Life, Love & the Pursuit of Chocolate...: True Blue! I can remember 14 years ago, at my parents house watching our Cats bring home number 7 and thinking..."One day I will be a part of that!" Even though it took over a decade, I finally got to be in the middle of the celebration for our 8th National Championship. 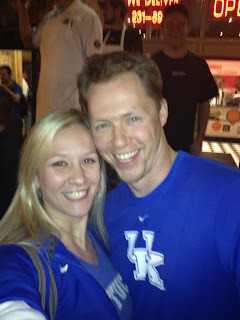 It was an amazing feeling and an amazing thing to watch with other True Blue fans....and I'm not saying this is the reason we won, but I deliberately wore the same shirt for this win that I wore for our sweet 16, elite 8, and final 4 wins....so I kinda feel like I'm about 50% responsible for it. 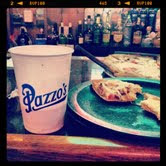 Check out the pulse at Pazzos as we watched the final seconds count down in the game. Everyone could feel what was about to happen and we were ready! Withing a minute and a half of the final buzzer, the whole restaurant was in the streets. Good thing we paid out tab at halftime! The celebration outside of Pazzo's on Limestone. So much happiness and positive energy in the streets...notice there's no cars burning or old couches being set afire! Our drive home was crazy! THis was at about 12:30am on a Monday night! Cars everywhere, honking, police cars...total madness! What Championship shirt should I get?? umm. I am thinking the middle one. love the 8 on the front. but the grey one is also badass.